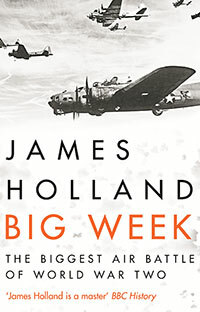 'James Holland is a master' BBC HistoryIt was to be the battle to end the air war once and for all.During the third week of February 1944, the combined Allied air forces launched their first-ever round-the-clock bomber offensive against Germany. The aim was to smash the main factories and production centres of the Luftwaffe and at the same time draw the German fighter force up into the air and into battle. Big Week is the knife-edge story of bomber against flak gun and fighter, but also, crucially, fighter against fighter. Following the fortunes of pilots and aircrew from both sides, this is a blistering narrative of one of the most critical periods of the entire war. Big Week was the largest air battle ever witnessed, but it has been largely forgotten - until now. 'James Holland is a master' BBC HistoryIt was to be the battle to end the air war once and for all.During the third week of February 1944, the combined Allied air forces launched their first-ever round-the-clock bomber offensive against Germany. The aim was to smash the main factories and production centres of the Luftwaffe and at the same time draw the German fighter force up into the air and into battle. Big Week is the knife-edge story of bomber against flak gun and fighter, but also, crucially, fighter against fighter. Following the fortunes of pilots and aircrew from both sides, this is a blistering narrative of one of the most critical periods of the entire war. Big Week was the largest air battle ever witnessed, but it has been largely forgotten - until now. James Holland is a historian, writer and broadcaster. The author of a number of best-selling histories including Battle of Britain and Dam Busters, and, most recently, Burma ?44, he has also written nine works of historical fiction, including the Jack Tanner novels. He is currently writing an acclaimed three-volume new history of the Second World War in the West. He has presented - and written - a large number of television programmes and series for the BBC, Channel 4, National Geographic, History and Discovery. He is also co-founder of the Chalke Valley History Festival and co-founder of WarGen.org an online Second World War resource site, and presents the Chalke Valley History Hit podcast. A fellow of the Royal Historical Society, he can be found on Twitter and Instagram as @James1940.